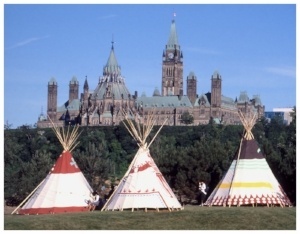 To become a British subject - to shed the confines of the Indian Act, embrace full rights of colonial citizenship and become “civilized” - was considered a privilege by the government but not by the Indians. Enfranchised Indians were to submit their chosen Christian name and surname; they would forevermore be recognized by that name. The 1857 Gradual Civilization Act arrogantly assumed that young men would fall all over themselves for the opportunity to become “full British citizens”. They were sorely mistaken as only one man voluntarily took up the offer. Band leaders were deeply disturbed by the Gradual Civilization Act and not supportive of their young men turning their backs on their heritage and traditions and taking a piece of land from the collective. When it became apparent that enfranchisement was not being taken up as expected or desired, the government ramped up their efforts with the 1880 amendment to the Indian Act regarding compulsory enfranchisement upon obtaining a degree or becoming a clergyman. Enfranchisement was extended to include those Indians who joined the military. The right to vote was also tied to enfranchisement until 1960 when Indians were deemed worthy of being able to vote in federal elections. Please see “Indian Act and the right to vote”. *We use the term Indian in this article for historical accuracy. RCAP volume 1 p 137 Source: National Archives of Canada, Record Group 10 (Indian Affairs) [hereafter NAC RG10], volume 245, part 2, number 11801-11900, microfilm reel C12339. If you found this article on the Indian Act and enfranchisement interesting, we hope you will share the article with peers and pals. Our one day course Working Effectively with Indigenous Peoples® fulfills the criteria of #57 and #92 of the Truth and Reconciliation Commission Calls-to-Action for business and government to provide Indigenous awareness training for staff and management.